Rapidly taking growth in development, Bharatpur is one of the major commercial city in Chitwan District of Nepal. Facilitated in every aspect of infrastructures, Bharatpur is a top destination for travel. There are many suitable transportation options to choose from, and the most convenient option is a flight to Bharatpur with Buddha Air. Within 20 to 25 minutes, you can reach Bharatpur from Kathmandu. Buddha Air also offers daily flights to Bharatpur from Pokhara. Bharatpur city is the main gateway to the first national park of Nepal. Established in 1973, the park was previously known as Royal Chitwan National Park. It was listed as a UNESCO World Heritage Site in 1984. Covering an area of 932 km2 (360 sq. miles), it is located in the districts of Nawalparasi, Parsa, Chitwan and Makwanpur of Nepal. Centuries ago, the Chitwan National Park used to be the finest hunting spot for Nepal's ruling class. As the park enjoys a tropical monsoon climate throughout the year, Chitwan National Park is a perfect habitat for various floras and faunas. Different scientific studies are conducted here by researchers and other agricultural and wildlife enthusiasts. There are more than 700 species of wildlife, with 68 of the species being mammals. This park is popular for protecting endangered mammals such as One-Horned Rhinoceros, Royal Bengal Tiger, wild elephant, gharial, monkeys, barking deer, monitor lizard and python etc. At Chitwan National Park, you will get a wonderful opportunity to spot Royal Bengal Tiger. Apart from mammals, it is the land for 544 species of birds, 56 species of reptiles and 126 species of fishes. Sauraha is a small village located just outside of Chitwan National Park. 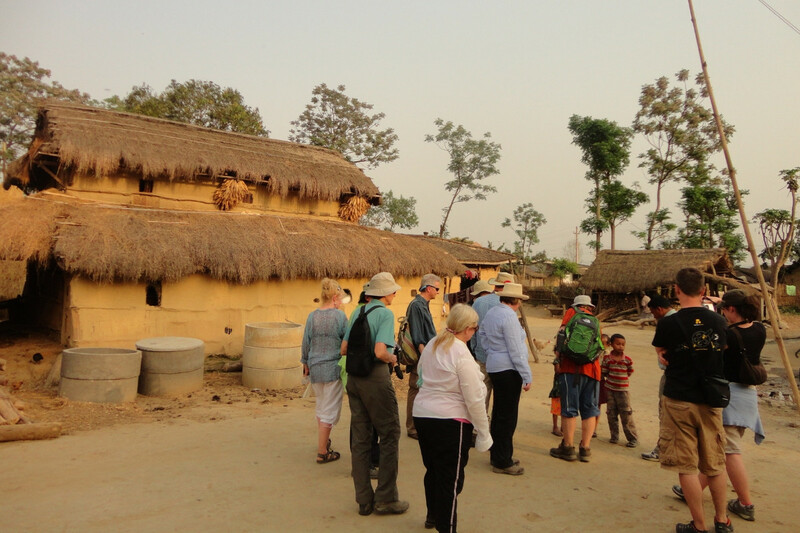 As the first stop into the park, Sauraha provides facilities such as accommodations, refreshments and nearby sights. Also referred by Tharu Village, it is the best place to explore the Tharu culture of Nepal. Visit the museum or stay overnight and enjoy their meals to know more about their lifestyles. Further, you can attend the cultural shows filled with music and dance. 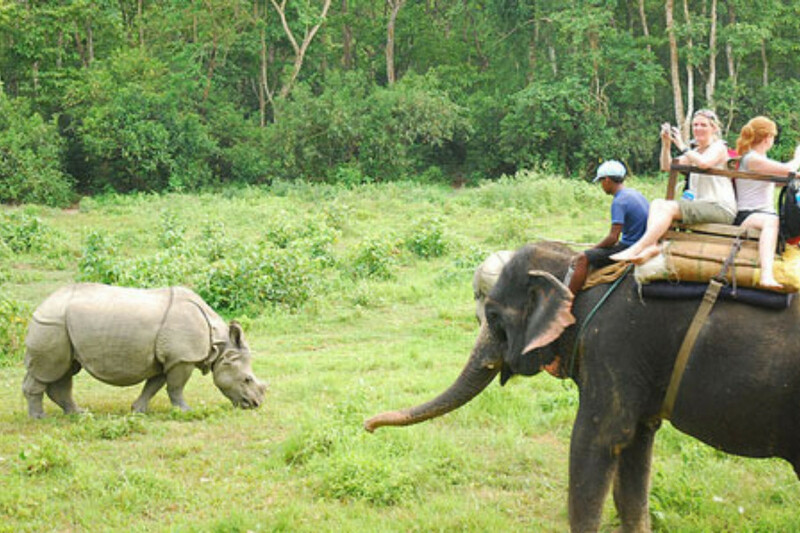 One of the top things to do in Chitwan National Park is Jungle Safari. To experience wildlife, a jungle safari is the best way to get guided tours by professionals. One of the popular safari is the Elephant Safari, where you sit on the back of an elephant and get close views of the animals and easily spot birds. An elephant safari is one of the best ways to spot the elusive Royal Bengal Tiger and One-horned Rhinos. There are also options for jeep safaris or a guided walk into the jungle. With an aim to protect the endangered elephants, Elephant Breeding Centerwas established in 1985 in Sauraha. At the center, you can get to experience the overall nature of elephants. You get to understand more about the elephant's reproduction procedure, observe the feeding time and even meet baby elephants! As an added bonus, there is a small museum located inside the breeding center. The Vulture Restaurant offers a unique dining experience, but do not fret - despite the name, the restaurant is for humans. The Vulture Restaurant also known as Jatayu Restaurant is the first vulture feeding site in Nepal. It lies in the buffer zone of Chitwan National Park. It has been established by Namuna Community Forest to protect endangered species of vulture. Bird watching is one of the popular activity, especially for bird lovers. With over 540 bird species, the park inhibits various endangered and migratory birds. Indulge yourself in nature as you watch them flocking around in the park. Chitwan National Park is 126 kilometers away from Kathmandu. To reach there, you can either take a direct bus or flight from Kathmandu to Bharatpur, Chitwan. If you choose to fly, you can reach Bharatpur airport at 20 minutes. From there, you can choose any convenient means to visit Chitwan National Park. If you are willing to travel to Chitwan in a package tour, Buddha Holidays - Buddha Air's travel subsidiary provides tour packages from Kathmandu to Chitwan. You can check the itinerary and book accordingly. For accommodations, there are different resorts and hotels available in Chitwan with good facilities. However, with Buddha Holidays we provide top class hotels such as Rhino Residency, Tiger Land, Jungle Villa, Barahi Jungle Lodge, Chitwan Paradise, Jungle Safari Lodge and Maruni Sanctuary Lodge. The park can be visited anytime as it is open all year round. If you are looking for a favorable time to visit, going there after December gives you higher chances of spotting endangered animals, especially the Royal Bengal Tiger and the One-horned Rhino. Chitwan National Park is one of the excellent destinations to explore wildlife in Asia. So don't miss the chance of traveling Chitwan National Park.